Big back-ups at wastewater plants thanks to flushable wipes. 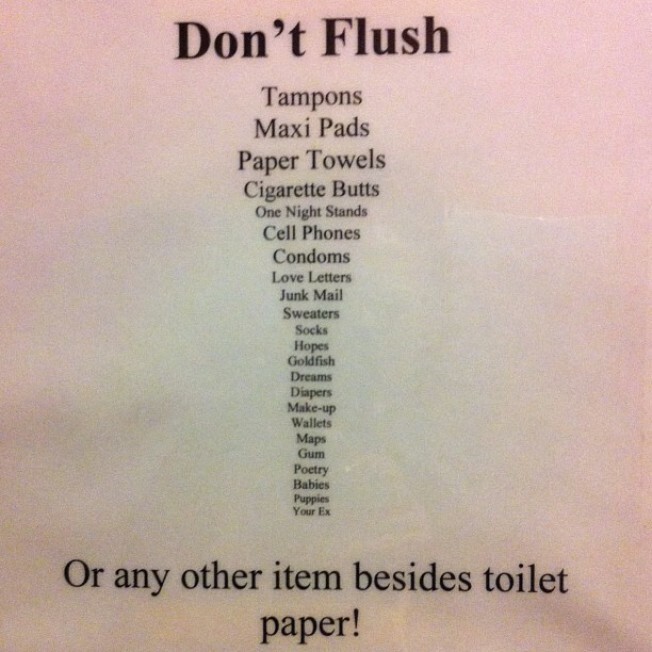 Flushable wipes belong on this list in San Francisco. Flushable sanitary wipes are clogging the pipes at several San Francisco sewer and sanitation plants, according to reports. Wipes advertised as flushable aren't dissolving in the way producers claim, according to the San Francisco Examiner, which reports of "major problems" at wastewater treatment facilities as a result. "Soiled feelings" are the result of the flushable wipes' major backups, the newspaper reported. Only three things can be flushed down toilets in San Francisco: urine, feces, and toilet paper, the newspaper reported. Wildly Unique Fou Fou Ha! Gets "Out of Order"
The wipes clog pipes and must be fished out by workers, according to the Examiner. Toilet paper dissolves in water in eight seconds, while wipes -- "bathroom cleanse cloths, baby wipes, disinfectant cleaning wipes and sanitary hand wipes," the newspaper reported -- are intact after a half-hour. A spokesman for manufacturer Cottonelle says that the wipes are indeed flushable. But wastewater officials are telling San Franciscans to think before they flush.